Marriott’s Harbour Point timeshare resort is located right on beautiful Hilton Head Island in South Carolina. Enjoy the best of a beach vacation while being pampered with all the luxury that a Marriott timeshare resale has to offer. Lush landscaping abounds on this property where picturesque sunsets, a year round climate perfect for recreation and southern hospitality and charm abound. Family friendly, this resort is perfect for the visitor who is serious about rest and relaxation. Any visit to this five-star-rated resort will be a vacation to remember! Located within Shelter Cove, at Plametto Dunes, Marriott’s Harbour Point timeshare resort overlooks Broad Creek, and is only two easy walking miles from the Atlantic ocean and beach. Buying Marriott’s Harbour Point timeshares for sale is a simple process and will gain you a luxurious two-bedroom, two-bathroom villa, with approximately 980 square feet of living space. These villas will easily and comfortably sleep six guests, and each villa has its own private balcony for relaxation or entertaining during the perfect sunset-kissed evenings. With three lit tennis courts, two swimming pools, shuffleboard and bocce courts, barbecue/picnic areas, fitness equipment and an activity program that is supervised, every possible amenity has been thought of and included in your fractional ownership at Marriott’s Harbour Point. This smoke-free resort was recently renovated, and all villas have been reappointed and redecorated for your ultimate convenience and to maintain Marriott's high standards of luxurious accommodations. If wandering away from your Marriott’s Harbour Point timeshare resale for some adventure sounds good, there is an abundance of superb shopping and dining options within walking distance, at the Shelter Cove Marina. Also available at the nearby marina are kayak and pontoon boat rentals, as well as dolphin cruises. Golf is taken very seriously on Hilton Head, and the PGA makes a stop on the island with many of the players bringing their families to this wonderful vacation destination. With more than 40 golf courses from which to choose on the island, any day is a perfect day for golf. In addition, the Pinckney Island nation Wildlife Refuge, Palmetto Dunes Plantation and the Hilton Head Plantations are nearby, and are wonderful scenic trips for visitors. If the commitment of full ownership is too much, consider Marriott’s Harbour Point timeshare resales or fractional ownerships. This type of ownership will still entitle you to all that the resort and surrounding area have to offer. And, with year round activities like walking or jogging along the beach, waterfront dining, chartering a fishing cruise, golf, bicycle trails, nightlife, horseback riding, scuba diving and more, there will always be something to do no matter the season. Marriott's Harbour Point timeshare resale deals are great at this property as you gain a villa in a pristine resort community, with world-class amenities at your fingertips. Rated at five-stars, this property excels in every way imaginable. Always a fabulous vacation opportunity, properties on Hilton Head remain very popular as a family friendly destination. Each timeshare resale is sumptuously appointed to maintain all the comforts of home such as: a private balcony, master suite with king size bed and oversized garden tub, separate living and dining areas, full kitchen including cookware and tableware, oven, microwave, stovetop, dishwasher and toaster, and televisions. With a nearby grocery store, there is plenty of opportunity for cooking in the gourmet kitchen. Each unit has its own utility room complete with washer and dryer for ultimate convenience. Bedroom linens are thick and plush, completely up to Marriott’s high standards. Whether for business or pleasure, any stay at Marriott’s Harbour Point resort will be fantastic. The onsite staff is friendly and helpful and their sole mandate is to ensure that your visit is memorable, and they will do whatever is in their power to aid you. A calm oasis in the middle of a picturesque island, and with perfect villas, perfect weather, and perfect sunsets…what more can you ask for? 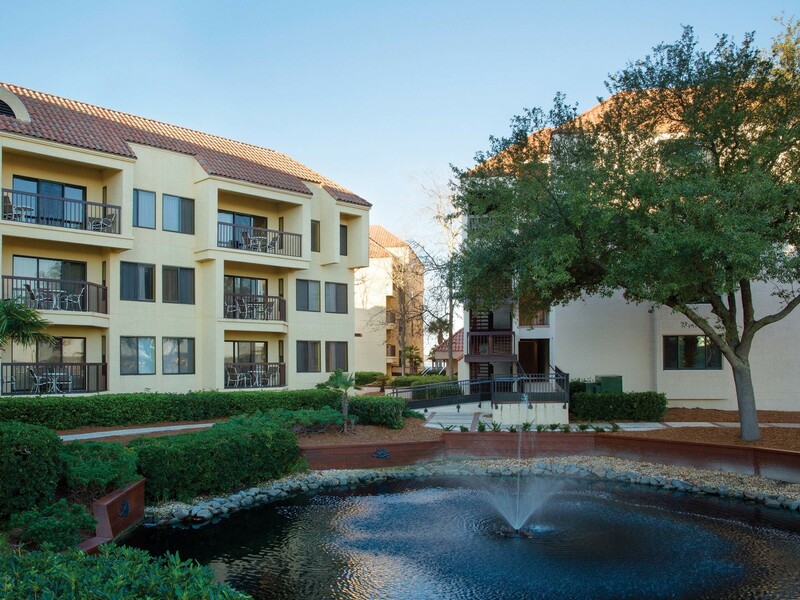 Buy a Marriott’s Harbour Point timeshare resale today. With all these amenities you will never want to sell your Marriott’s Harbour Point timeshare especially if you pick up one of our timeshare resale deals at today’s fantastic prices. Contact Premier Timeshare Resale today!